As I sit here on this cold, winter day, watching a massive snow storm outside, I am thinking back to warmer days and longing for summer! As I was reminiscing, I realized that I never shared my second son’s 3rd birthday party. 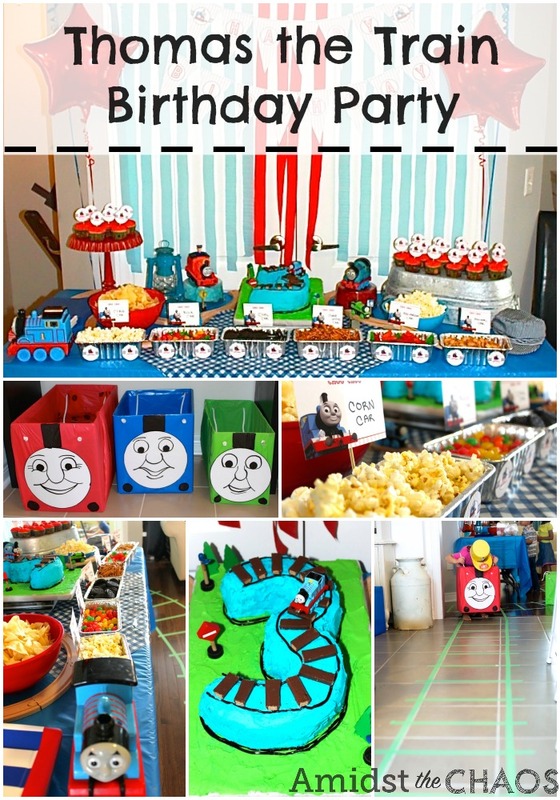 So today, I want to share with you this Thomas the Train themed birthday! My son was obsessed with Thomas the Train since he was very young. After his 2nd Birthday Party, he knew he wanted Thomas next. 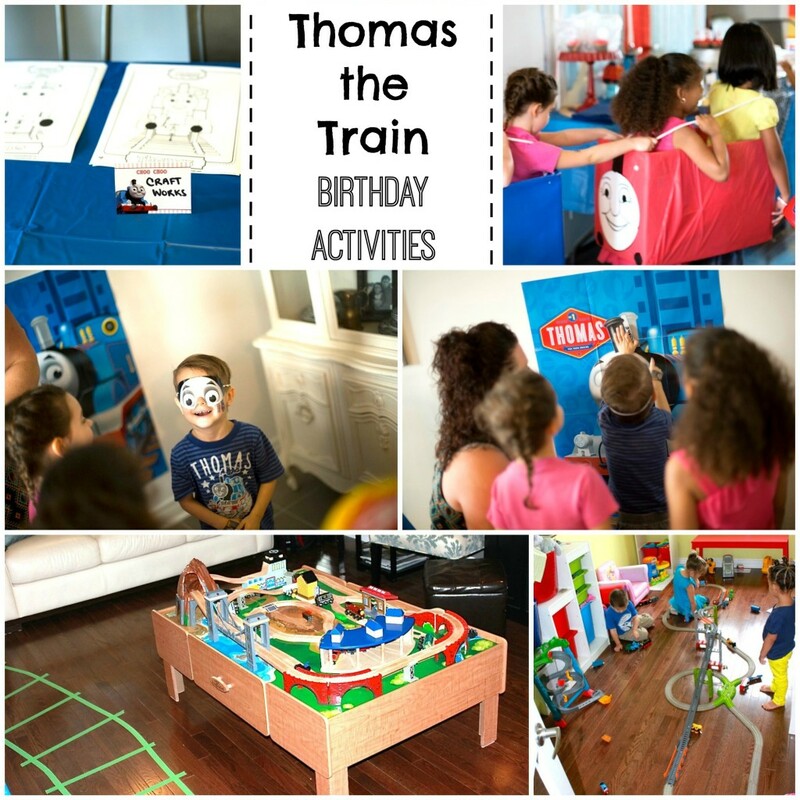 He actually loved his Thomas party SO much that he was even asking for the same party for his 4th birthday! I had to convince him that was sort of silly and instead, he opted for a Transformer Party. So let me breakdown the party for you! I always start with a main table to display the food. 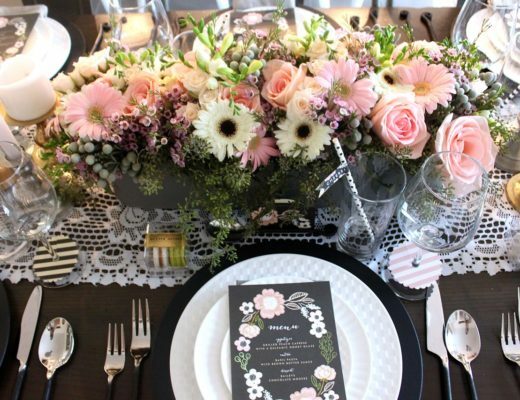 These are known as tablescapes and what you can find all over Pinterest, when searching for any birthday or wedding decor. When starting with the table, I always try to think through the layout: what will I be serving, how will that fill the table, what different heights can I add in and what will the backdrop be. I knew that the focus of this party would be the activities so I opted for somewhat simple decor. I purchased four helium balloons from Party City and then added so red and blue streamers as the backdrop. I also found these free printables, which I used for the “Happy Birthday” as well as cupcake toppers, water bottle labels and food labels. For food, we kept it pretty simple. My mom and I made the cake ourselves, using two oval cakes, colored icing, black licorice ropes and kit kat bars! 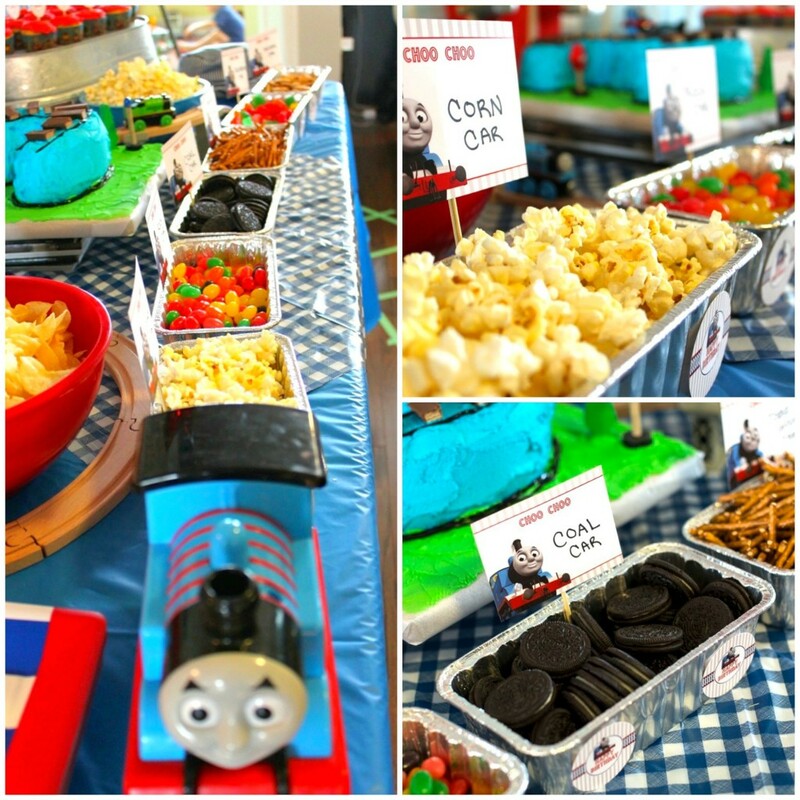 I would say the highlight though of the tablescape was the Thomas the Train Candy Cars! 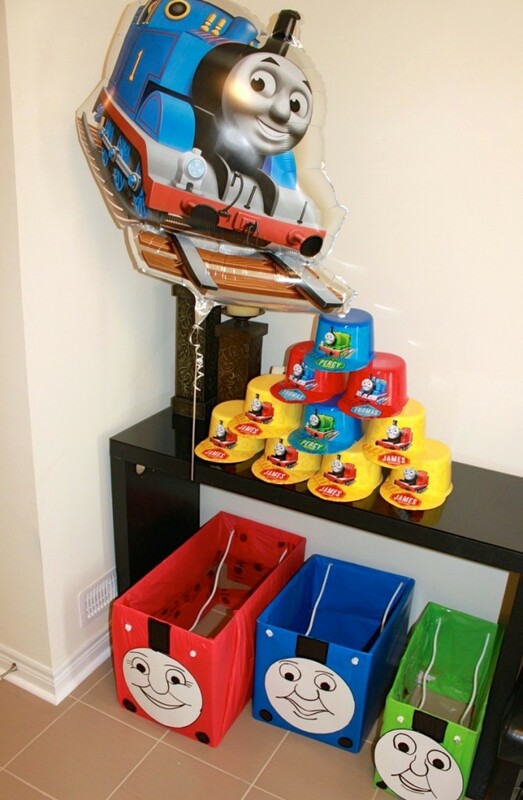 We filled each car with Thomas themed items, such as rocks (jelly beans), corn (popcorn) and Jobe wood (pretzels). As I mentioned, the activities were one of the main focuses for the party. 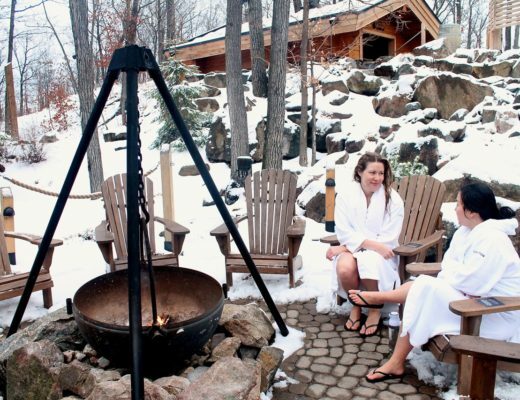 At the time, our backyard wasn’t finished and so even though it was summer, we had to stay inside. 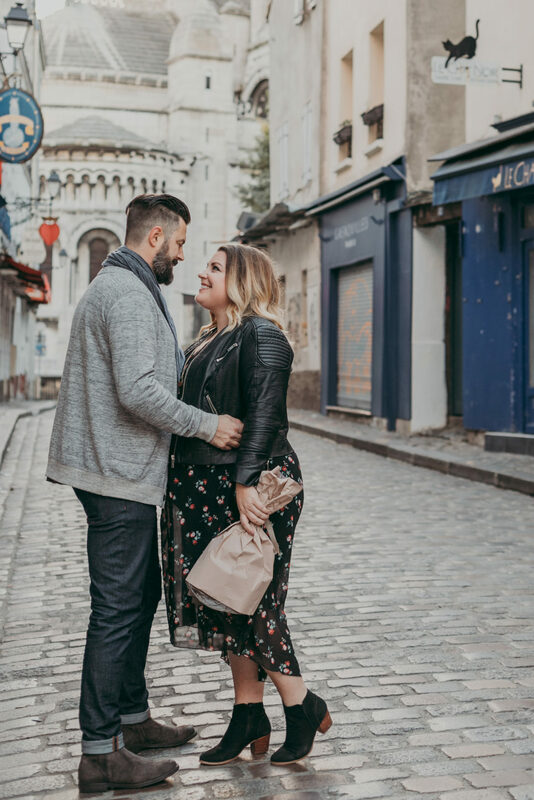 And I want to add here that we don’t have a huge home…but that’s no excuse! You just need to get creative with how you set up your space and where you place your activities. 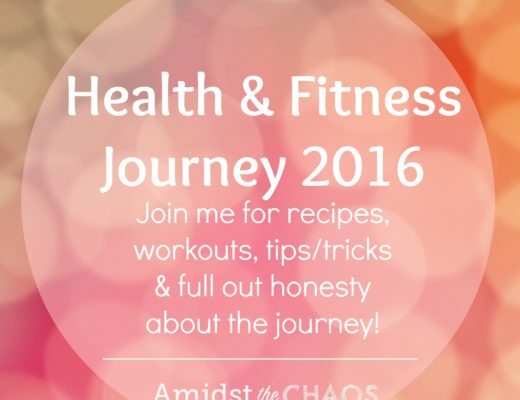 We had over 30 people in our home for that party and at times, when all in one room, it felt cramped, but most of the party felt spaced out because of where I set up various activities. We set up the wooden train table in the living room, instead of our usual coffee table. 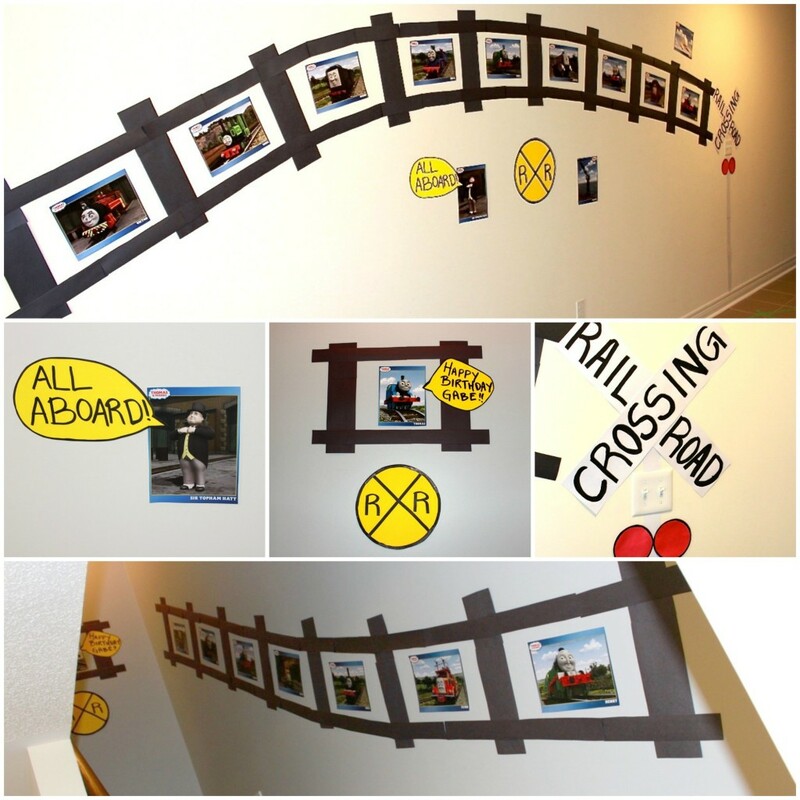 Then we placed the motorized trains/track in the playroom. At the kitchen table, I set up “craft works” where I printed a bunch of free Thomas the Train coloring pages from the Thomas and Friends site. We also played “Pin the Steam Whistle on Thomas” which was hilarious to watch! From the very minute that our little guests were greeted at the door, they stepped foot onto the railway! Using some painters tape, I made a railway that led from the front door, all the way upstairs and through the kitchen. 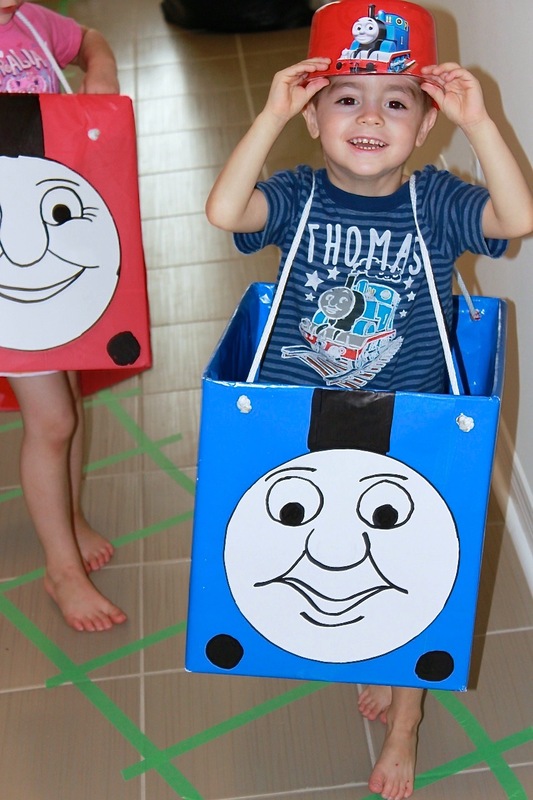 My husband and I also created train cars that the kids could wear and quite literally become a train on the tracks! 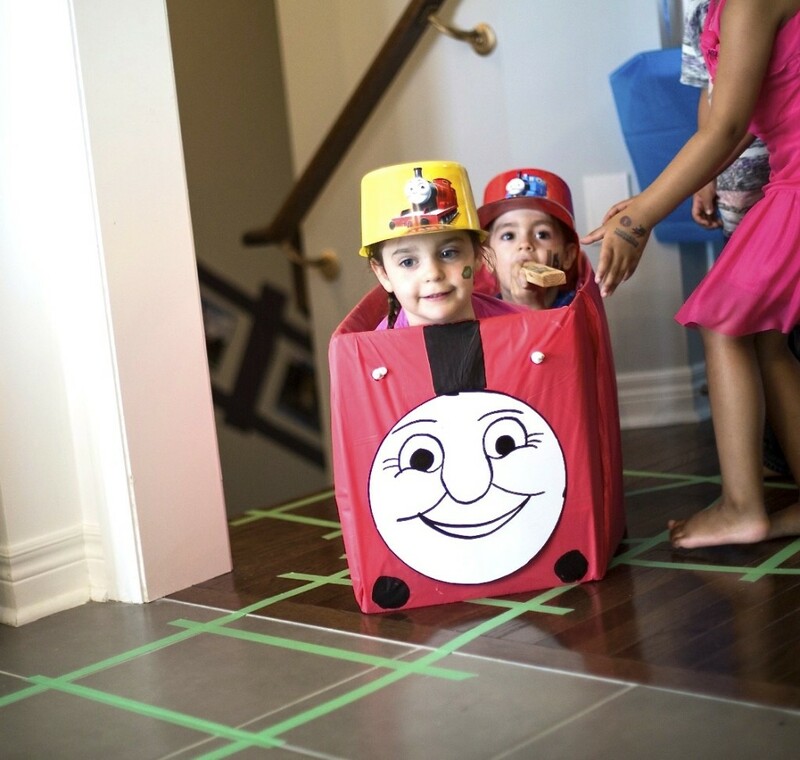 Using old diaper boxes and plastic tableclothes, we were able to make Thomas, Percy and James for the kids to enjoy. I will say that this was hands down, the most exciting activity at the party, for our little friends. One final thing I wanted to share with you was not only did I make tracks on the floor, I also created tracks on the walls, with many of the Island of Sodors favorite characters! Again, these posters are all available on the Thomas and Friends website for free, you just need to download and get them printed at your local copy place. Then I added in a few extra railway items, that I constructed out of poster board, to make it more realistic. To this day (a year and a half later) many of these characters are still on the walls in his room (we haven’t painted his room yet). Overall, it was such a fun party. 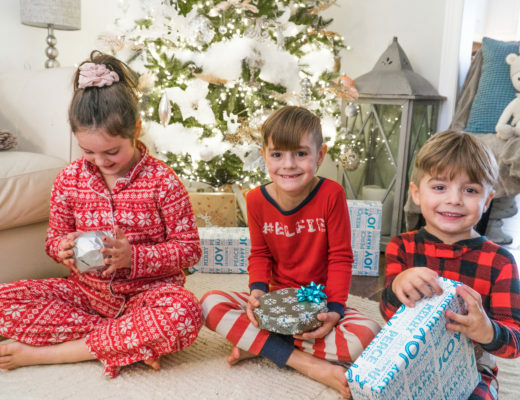 The kids had a blast…my son had a blast! And that’s the most important part. He still talks about this party to this day! And that makes it all worth it! I got them at Party City! They have some great Thomas the Train party supplies! Hello. Good job! What were the labels for the food train? I can’t tell what they all say from the pictures. We had coal car (oreo’s), rock car (jelly beans), jobe wood car (pretzel sticks), corn car (popcorn), animal car (animal crackers)! Hope that helps! I simply used black construction paper and cut out long strips and then taped them all together to make a track! Hi, I love you party plan, for the cardboard trains, did you glue the plastic table cloth? 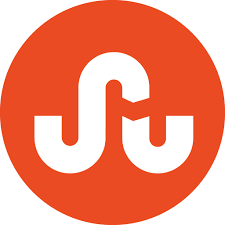 Thanks Sindhu. We actually used packing tape for the plastic table cloth. Hope this helps. This is so adorable! I am having my 2 year olds at a local park so I am a little befuddled on how best to decorate! I love the train cars with food! We aren’t doing Tommy but will be doing Train theme. Where did you get the label cards for the train cars? Coal Car, Rock Car, etc? Thanks Courtney. As for the label cards, I found a print seller on Etsy. Hello this is so cute and great. My son loves thomas the train and for his third birthday in march we are doing a thomas themed one. 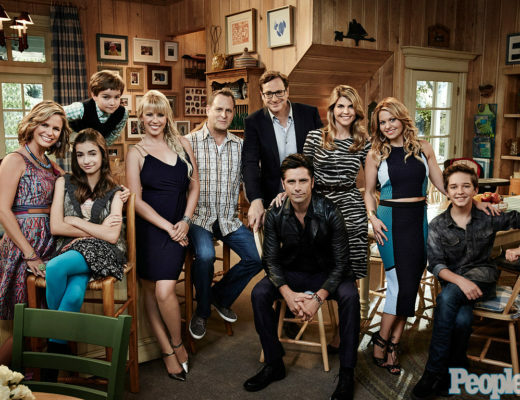 I’m so excited. Thanks. That is so excited. It was a hit for my son and all who attended the party. Thanks. Everyone got to bring their hat home along with some treats. 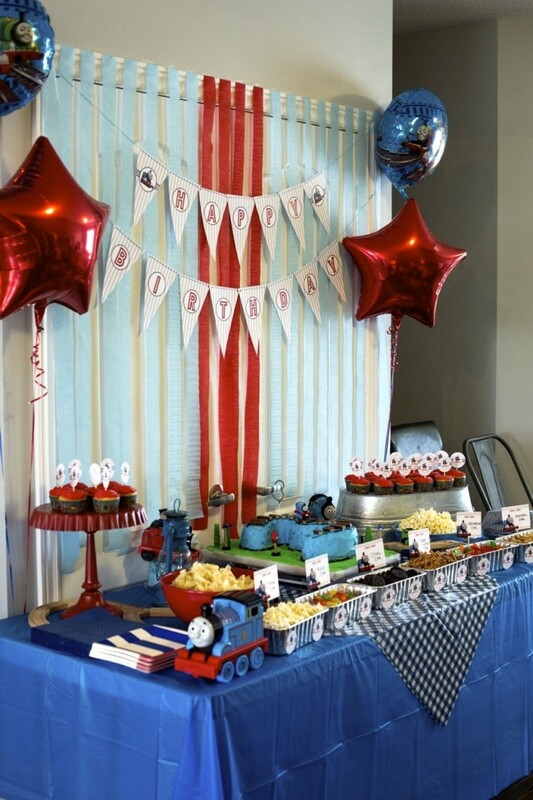 Hey great birthday party..from where did you get face for Thomas train cars?? Thanks Radhika. We made the faces for the Thomas train cars by using regular card stock and sharpie markers. Thank you! They are from Party City! Good luck!